Allergan recently announced the availability of the style 410 breast implant with much hoopla and excitement. I recently went to a meeting about this implant and have read and spoken with more experienced surgeons about this implant. As of today, I have not personally used this implant in a breast enhancement procedure. Some of the issues I will bring up will perhaps upset the Allergan representatives. However, I have an obligation to be as objective as possible. Not only is this of benefit for the patient, but also a benefit for my practice as well. The less complication and revision rate I have, the more my practice will thrive. The style 410 implant is a silicone gel implant which is more cohesive than previous gel implants. This means the gel does not migrate as much and will hold its shape more than previous implants. This implant has been called the “Gummy Bear” implant. Predictably, some surgeons are going to market this heavily to get more business. Some patients, not knowing much about this implant, are going to demand to have this implant used. From evaluating this implant, the feel is very nice. It feels like a teenage breast which has dense breast tissue. It also holds its shape when in a standing position, which means less chance of implant shape distortion, especially in the upper to middle pole of the breast. On the negative side, because the implant is anatomical in shape (flatter on top and fuller on the bottom) the surface is textured to minimize risk of mal-rotation. The implant pocket must also be made very tight (like a fist fitting into a glove) to minimize rotation. With a textured implant, there is always a higher chance of rippling, as the breast tissue will adhere to the textured surface and potentially pull on the skin of breast. If the implant should rotate, only surgery can correct it and to try to keep the implant in place may be very difficult. I have also spoken with a surgeon who has removed these implants, and perhaps due to the aggressive texturing of the shell, these implants have been very difficult to remove. A recent article in Plastic and Reconstructive Surgery (Volume 130, Number 2, pages 423-440), the most recognized journal of our specialty, has shown a statistically significant increase in late seromas (fluid collection around the implant) in implants with this type of texturing. Although most cases were idiopathic (no cause identified), it required aspiration of the seroma and potentially additional surgery. Two guest experts were asked to write a discussion about this article. It is interesting the second reviewer also had a difficult time removing this implant. An additional obstacle to using this implant is the cost. Most surgeons will charge $1500-2000 extra for this implant, since the cost is much higher and there potentially will be increased operative time. Additionally, the size of this implant is not as large as the smooth silicone implants. 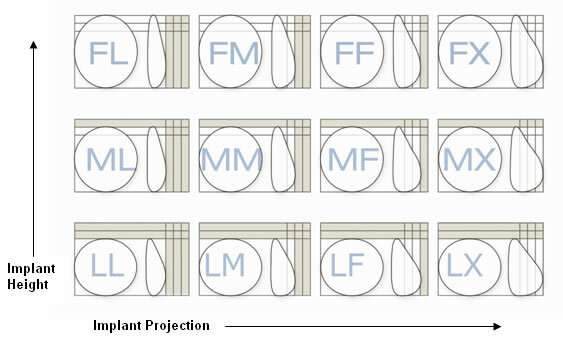 For example, the full height and full projection (style FF) 410 implant with a width of 14.5 cm has a volume of 595cc. 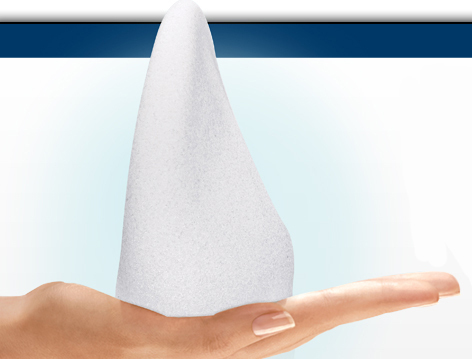 For smooth implants, the largest Natrelle style 45 has a width of 14.2 cm and a volume of 800cc. I think it is CRITICAL for both the surgeon and the patient to think of this implant more in terms of shape rather than size. This is opposite of how we size patients with the round implant. 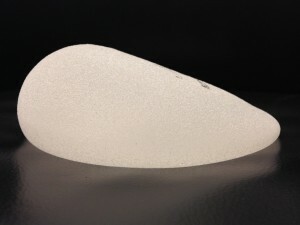 If the patient has significant upper pole breast asymmetry, this implant will be a poor choice due to its shape. So, will I consider using this implant? Yes, in a thin patient with almost zero body fat and size A breast and tight skin envelope, no matter how hard I try to make the pocket as natural as possible, the roundness of the round implant sometimes shows. Although the patient may be pleased with the result, I do not like the round look in the upper pole of the breast. I also think there will be a lot of demand for this implant after breast reconstruction. However, I want to caution the patient not to become too excited and ask for this implant, thinking it is going to give one a magically wonderful result. I and majority of plastic surgeons in this country have used the smooth, round implant for decades. When the implant is in an upright position, there is some migration of the implant to the bottom. Therefore, a round implant will become somewhat anatomical when in an upright position! That is why I have been able to obtain a natural slope in the upper pole of the breast with this type of implant. As I mentioned previously, I think patient selection is key for this implant. So why not make a round implant with this type of gel? My understanding is due to the increased cohesiveness of the silicone gel, the gel does not migrate downward and the implant maintains a round look even when in an upright position. So please do your homework before considering this implant!